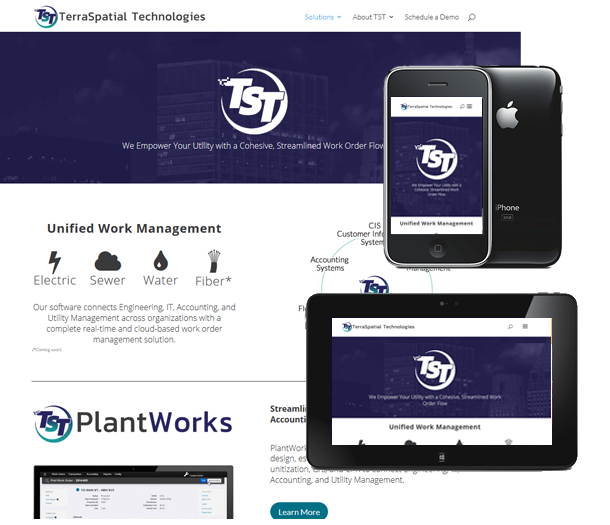 TerraSpatial Technologies is an Oregon-based software and solutions provider with cloud-hosted solutions for utility work order management. Protocol Three developed the concept, branding, and communications for the brand new TST website with blog, CRM, e-mail, and form integration for easy and accountable lead generation. Protocol Three, for us, has meant excellent service, prompt attention, and a proactive approach to our company’s digital marketing and re-branding strategy. Our website was up and running in budget and on time. Protocol Three has went above and beyond to help us with our print marketing, stationary, and event presentations. We’ll continue working together on our future marketing initiatives. TSTOregon.com is an Oregon-based software and solutions provider with cloud-hosted solutions for work order management specific to electrical, sewer, water, and fiber utilities. Protocol Three developed the concept, branding, and communications for the brand new TST website with blog, CRM, e-mail, and form integration for easy and accountable lead generation.